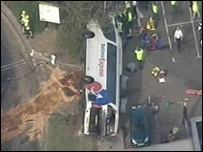 Eight people injured when a coach overturned at a motorway service station remain in three hospitals. Four people, including the driver from West Bromwich, remain at Northampton General Hospital after the crash at Newport Pagnell in Bucks on Monday. The driver, 34, is under arrest on suspicion of a drink-driving offence. A 57-year-old woman and 20-year-old man are at Milton Keynes General Hospital. A woman, 39, and a 63-year-old man at the John Radcliffe Hospital in Oxford. All are in stable conditions and the 63-year-old has undergone surgery for his injuries. Police are waiting to interview the driver about the crash involving the coach which was travelling from Birmingham to Stansted Airport which left 30 people injured. Other passengers being treated at Northampton General Hospital include a 45-year-old woman from Church Stretton described as stable following an operation but she is likely to require further surgery. The condition of a 60-year-old man from Goussainville in France is described as fine and a 28-year-old man from Coventry is stable and awaiting results of tests before being considered for discharge. At Oxford a 39-year-old woman from Worcester is stable and a 61-year-old man from Kenilworth is said to be improving after surgery. The Newport Pagnell Services has now reopened and is working normally after the slip road was repaired.